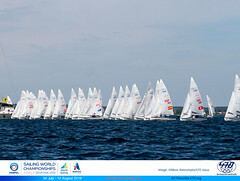 Competitors at the 470 World Championships were blessed with another day of unbeatable weather off Rungsted, north of Copenhagen, Denmark. Blazing sunshine plus a stable southeasterly breeze that started at 8 knots and ended up closer to 20, allowed the race organisers at the Royal Danish Yacht Club to cash in on the conditions, holding three races for the five fleets, rather than the scheduled two. After five races a discard has come into play. Two teams remain tied at the top of the Men’s Division where the Netherland’s Sven and Kalle Coster and Croats Šime Fantela and Igor Marenić are on seven points, having both discarded eighth places. 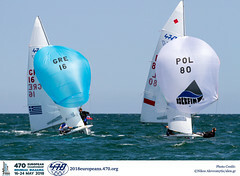 Fantela and Marenić, who usually sail out of Zadar, won the first two races today in the Men’s pink group, the first narrowly ahead of Israel’s Gidi Kliger and Udi Gal, the second in front of New Zealand’s Geoffrey Woolley and Mark Overington. “It was really good, we are really satisfied,” said Fantela. “Conditions were specific in the first race because of the strong current, so everyone was trying to start at the committee boat and tack towards shore. We made two good starts and were on the right side and it was a fight between five boats with the rest a long way behind.” On the final race they went the wrong way up the first beat, rounding the top mark 14th, but managed to claw their way back up to sixth. The Aussies had a good day today posting an 8-3-2, the 8th being a welcome result after they had restarted sensing they had been OCS. “We negotiated the fleet and got back around the boat and started well and truly last, by a long way and came back through. But the problem is we found out later that we weren’t over! Otherwise it was a good day,” said Page. Charbonnier, who took two years out to compete in the America’s Cup with Areva Challenge, has started sailing in January with Baptiste Meyer, who was his coach for Beijing. Meyer has not competed for 12 years. They have had consistently been in the top ten throughout this season, including a win at the Princess Sofia Trophy in Palma. While it is tight at the top of the men’s division, among the women, a 3-2-1 scoreline today has allowed the Netherlands duo of Lisa Westerhof and Beijing silver medallist and double world champion Lobke Berkhout to surge into the lead on seven points. Trailing them are eight boats packed together on 14-17 points. Among this group is the new British pairing of Beijing Yngling Gold medallist Pippa Wilson and Saskia Clark who are now sixth, the second Skandia Team GBR women’s team behind are Penny Clark and Katrina Hughes, who lie second after winning the last race in their group this afternoon. Wilson tried her hand at the Laser Radial earlier this year, found it wasn’t to her liking and was trying to get into the 470 at the same time as Saskia Clark and Penny Clark were looking to move on. 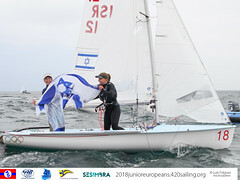 Wilson’s summer was a slow one suffering from a knee injury and tendonitis in her wrist and the new pairing has spent just 10 days sailing together before this regatta. Wilson is not new to the 470 though, having spent two years campaigning one before joining Sarah Ayton and Sarah Webb in the Yngling. Tomorrow the qualifying rounds continue. The forecast is for more southeasterly breeze early in the afternoon, but with the wind veering south and dropping later on and with less sun sadly.